In view of the persecutions the church is faced with, at least 10 pastors with their families were arrested as they worshipped in church services across the northern Indian state of Uttar Pradesh last Sunday. In addition to the detained persons, police are said to have also arrested three more believers on Monday and threatened another pastor in the State in an effort to get him to stop holding services. According to CSW, Pastor Bahavan Ram and his church in Kariyabar were disrupted during their Sunday services by police after Hindu nationalist groups claimed to that Bahavan was converting people. In some states in India, forcibly converting someone through coercion or allurement is considered a crime and forcible conversion laws are used in Hindu to launch criminal complaints against Christian leaders. But in Ram’s case and that of the churchgoers in Kariyabar, the police were not able to find any proof to support the accusation of forcible conversion and no arrests were made in that case. A mob also stormed the Assembly of Believers Church in Shastri Nagar Kanpur and threatened the pastor with “severe consequences” if the church didn’t stop holding its Sunday services. The CSW’s recent report highlighted an estimate of 23 pastors and family members arrested or detained randomly between August 20 and September 18. The pastors are under investigation for accusations that they extorted conversions from Hindus by spreading false information about Hinduism. 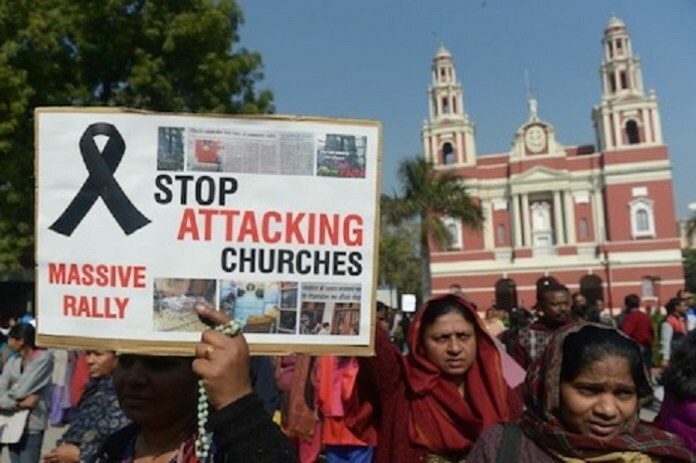 “In Uttar Pradesh Hindu radicals have fabricated unfounded accusations against innocent Pentecostal Christians,” Sajan K. George, president of the Global Council of Indian Christians, told the Catholic news outlet.